Another devastating hailstorm has struck Texas, the fourth major insurance and reinsurance loss in a month, with an April 12th hail storm striking the San Antonio area set to become the biggest hail insurance loss in the state’s history and push recent insured losses towards $3 billion or higher. Texas has been beset by severe weather in recent weeks, with a number of spells of convective storms resulting in major damage due to hail, tornadoes and high winds, while the state has also been dealing with near record levels of rainfall that caused damaging floods in the Houston area. The Insurance Council of Texas estimated $600m of insurance losses from a large hail storm event in the Dallas and Fort Worth regions of Texas on March 17th, and a further $700m of insured losses from similar weather conditions in the Denton and Colin County areas on March 24th, taking the total to $1.3 billion. A further severe hail event on April 11th battered parts of Northern Texas around Dallas and Forth Worth, with the worst hit areas the cities of Plano, Wylie, Frisco, and Allen, and the Insurance Council of Texas said that this event would cause further insurance damages into the hundreds of millions of dollars. So those three events pushed insurance and perhaps reinsurance industry losses certainly over $1.5 billion and perhaps nearer to $2 billion, although the Insurance Council did not release a specific loss estimate for the April 11th event. Now another severe hailstorm which struck the North San Antonio and Bexar County areas of Texas is being called the most costly single insurance loss from hail in the state’s history, based on insured loss estimates taken from insurer projected losses and after verifying their percentage of the marketplace. Over 110,000 vehicles and thousands of homes are reported to have been damaged by the April 12th hail event, damaging roofs and knocking holes through car windows. The National Weather Service verified reports of some hail reaching 4 ½ inches in diameter. 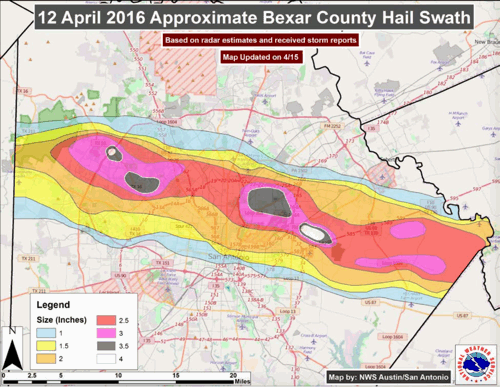 “The storm primarily struck the northwestern portion of Bexar County moving across northern areas of San Antonio with large hail that was shaped like jagged rocks,” explained Robert Crosby, executive director of the Independent Insurance Agents of San Antonio. Estimated insured losses to automobiles are put at $560 million, while damage to homes and businesses is expected to reach $800 million, according to the Insurance Council. The $1.36 billion total insurance industry loss estimate is higher than the May 5th 1995 hailstorm that struck Fort Worth causing an estimated $1.1 billion in damage, making this Texas’ most costly hail loss event. There is expected to be additional uninsured losses from homeowners without residential property insurance and vehicle owners without comprehensive insurance, with the economic damages due to lack of insurance expected to be high. So, adding this new $1.36 billion of insurance industry losses from the April 12th hail storm, to the $1.3 billion from the first two events in March and the April 11th hail event, for which there is no specific estimate aside from the Insurance Council’s “hundreds of millions of dollars”, could easily see the total just from four severe hail events creep over $3 billion, once all claims are in. With Texas also having faced the severe flooding in the Houston area over recent days, the state is racking up a significant insurance bill already this year, which is sure to result in reinsurance claims, with aggregate multi-peril contracts perhaps particularly at risk with so much of the year to run. It seems likely that there will be some impact to ILS funds or reinsurance sidecars from these events as well, even if only attritional. Without doubt, there is the growing potential for attritional losses for the ILS fund market, owing to any exposure to collateralized reinsurance particularly on aggregate contracts. The Houston flooding event looks set to cause in excess of $1 billion of insurance industry losses, just from the damage that is visible and the event has been likened to a tropical storm that caused a $3.5 billion insurance loss from flooding alone. Bunting went on to explain that Texas is often beset by hailstorms, but that this year, the storms just happen to be hitting heavily populated areas. So Texas has had a rough start to the year and this is going to impact on the reinsurance market, once aggregated and likely ILS funds and sidecars in some way, although perhaps only minimal impacts to most of these. With the insurance losses from the Japanese and Ecuador earthquakes also needing to be paid, the rate of catastrophe loss in 2016 perhaps seems a little higher than recent years, but still this all remains well within the large catastrophe budgets of the global reinsurance industry and while likely to impact earnings, is unlikely to be too significant yet. “The large scale pattern calls for more storms next week,” Bunting warned, implying that Texas’ run of severe weather catastrophe losses may not be over yet. – Houston, Texas flooding likened to $3.5bn tropical storm Allison. 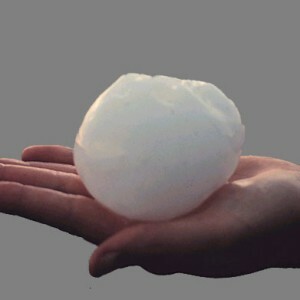 – Recent Texas hail insured losses to easily exceed $1.3 billion.